Doheny’s Crash Repairs are the leading vehicle crash repairs company in the Kilkenny area, based at the Westcourt Business Park on the outskirts of Callan. They’d had a basic web presence since 2009, but the site did not fully reflect the expertise and range of services offered there, and did not compare favourably to websites of competitors in the wider south-east area. They engaged us for an extensive website design upgrade and also for SEO Services, to ensure they would rank highly for crash repairers in Kilkenny. In consultation with Chris Doheny, Managing Director, we gathered all relevant information about the company and agreed upon the best method of structuring it in a new website design. We also reviewed the competitors’ websites, to determine the extra services offered by Doheny’s in order to highlight those in particular. Our copywriter produced content as per the client specification, and once it was agreed upon, it was forwarded to a developer for the build to begin in earnest. Key to this website design was the need to balance detailed information about Doheny’s services and expertise with ease of use for the user, who has probably just been through the upsetting experience of a crash. 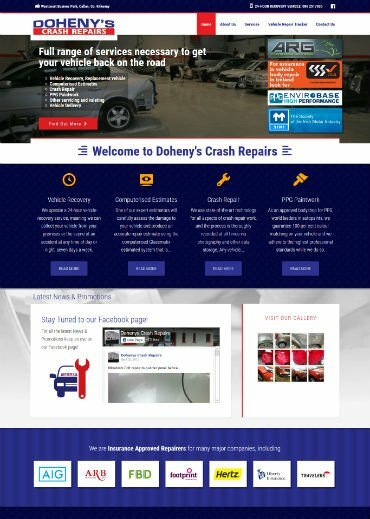 A home page design briefly showcasing the main elements of Doheny’s services (24-hour recovery, computerised estimates, crash repairs, and PPG-approved bodyshop) was selected, with a strong colour scheme to re-inforce Doheny’s standing in their field. Logos for official accreditations, insurance approvals, and testimonial providers were strategically placed on the home page and throughout the site for optimal effect, and overall, the site was designed to speak clearly to the user so that they could be assured that Doheny’s provide top-class quality and service at all times. The website also allows clients of Doheny’s Crash Repairs to log in to an online repair progress tracker via their vehicle registration number and individual PIN. This gives them real-time updates on matters such as work carried out on their vehicle so far, and estimated completion time. Doheny’s Crash Repairs is one of only fifteen crash repair companies in Ireland using this service. Need to get back on the road quickly and with no fuss? Visit Doheny’s Crash Repairs today!